Give the gift of swordplay! Fencing parties are active, engaging, and fun for aspiring swashbucklers ages 6-14. Our 90-minute parties provide a safe introduction to the sport with instruction from our professional coaches, plus challenges and fantastic fencing games. A fencing party consists of a 90-minute session, followed by 30 minutes for food or cake (not included). All equipment is provided. $250 for up to 20 participants; $15 for each additional. 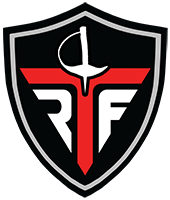 Please email darius@researchtrianglefencing.com or call (919)589-3783 to schedule a date/time. We require contact information (name, phone, email address). At the time of the booking, we require a $25 non-refundable deposit. The deposit is applied to the event balance, which is due at the time of the event. The deposit can be paid at the club, we can collect payment over the phone, or e-Invoice. Bring your guests, a camera for exciting action photos, pizza/cake/treats, and signed waivers. We will provide tablecovers to decorate the room, but do not have utensils available. You may provide any decorations that you’d like. Please note: we do not allow confetti, silly string, loose glitter, or piñatas. When can we schedule parties? Parties are most commonly scheduled on weekend afternoons. However, we are happy to accommodate office groups or field trips during the week, staff availability pending.